jimmy fallon | True Endeavors Presents: music, tours, tickets, mp3 downloads, concert pictures, videos, Madison WI. The Lumineers On Fallon: TONIGHT! 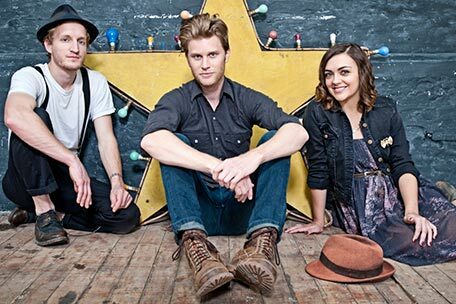 The Lumineers are one of the hottest bands in America right now, and it’s not hard to see why. The heartfelt music that the indie-folk trio creates inspires soulful sing-alongs and infinite repeated listens. Our friends in St. Louis will get to see the band live at the Chaifetz Arena on October 4 (tickets here), but the rest of us can check them out from the comfort of our living rooms tonight when they star as Jimmy Fallon’s musical guests. Be sure to tune-in and let us know what you think of the performance. Did You Catch Yo La Tengo On Jimmy Fallon? Indie rock royalty Yo La Tengo stopped by Jimmy Fallon’s Late Night studios earlier this month to perform the bright “Ohm” from their latest release, Fade. Check out their vibrant performance featuring Portlandia‘s Fred Armisen on drums here. Yo La Tengo will return to Madison’s Barrymore Theater next Tuesday (February 5) to perform two sets for their loyal fans. Get your tickets here.